Mark Yates generated a huge amount of income for CTFC by getting to 2 play offs, including one Wembley final, and a host of big FA Cup and ‘League Cup’ matches. This, after CTFC almost went into administration following the Martin Allen debacle. Mark Yates rescued the club and was never properly appreciated by some ‘fans’ who will only support a winning side. It was Buckle that made a rescueable situation impossible. Gary & Pete Johnson have generated a huge financial windfall by finding Mo Eisa. The knives already seem to be out amongst some, which again will not take account of what they’ve actually done for this Club, in particular getting us back in the Football League. There is more to come in terms of what that windfall could do to improve our Club. Of the home side’s that played the first game of the season, we were bottom of the attendance chart. And that was not because of last Saturday’s defeat. Had we have won that game, the figure would have been the same, obviously. Crowds for Cheltenham games have dwindled over many years. I know people will say that it is because of the Football being served up, but the truth is that even when we won the Vanarama League, the local public were not engaged. The Club can only provide a level of football based on gate receipts, and hopefully some decent sponsorship, or revenue streams away from football. Sponsorships are not likely to materialise if the businesses are only hitting 2,719 people. People need to face up to the fact that we can barely sustain football at this level and that’s why we are where we are. We should be grateful that Mo Eisa has provided a lifeline that has the chance to improve the Stadium and therefore improve other revenue streams, whilst at the same time enabling us to compete for quality players to an extent that DOES NOT mean paying over the odds for an unproven non-League striker, and gifting a big chunk of our windfall to the likes of AFC Fylde. Lord Elpuz. Are you 100%% certain Pete and Gary Johnson were responsible for bringing Mo Eisa to our club or were they advised by someone else ???? do we know that for a fact? has it ever been publicly stated? yet all that you said about Yates is fact. I was one who said I wanted Yates out at the time but I tell you what I would have him back tomorrow over the current clown. Are you saying that there is an alternative truth as Pete Johnson has been given all credit for finding him? Lord Elpuz - as for RCS, do you say if we had not sold Mo we would be insolvent ? Plainly not. We did not need Mo money to survive as was repeatedly said. On that basis, we should either have kept Mo or sold and used some of the money to improve team / squad. To do neither is the problem. If reports are to be believed we would have signed Rowe if Fylde had accepted 200k reported bid. So manager and club wanted to do it ; not through prudence it did not happen. We left it too late. The folk of Cheltenhamshire are fickle and there is not enough supporter base but that should not mean we should have no ambition and be grateful for survival - if that is your point, explain Accrington Stanley. I think if you re-read my last post you will see that I said we are “barely sustainable” that is not “insolvent”. We did not need Mo’s money to survive, but the money from his sale gives us an opportunity to improve other revenue streams. Had we kept Mo there was no guarantee we would have finished any higher, because of our low crowds, when a Cheltenham public of around 97% does not support football. On the crowds we get, we are about where we should be. It is too early to judge the present team after one match. Too many people are being too quick to throw in the towel. 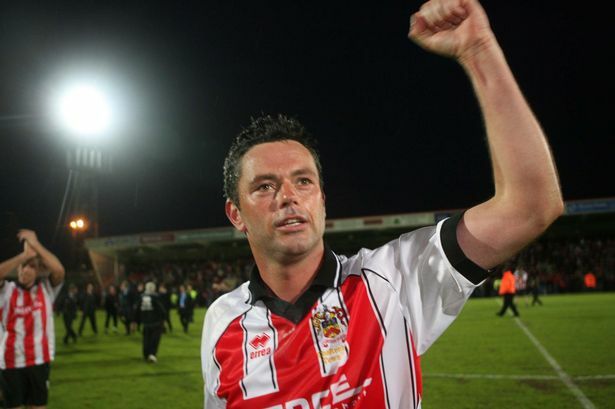 I fully expect CTFC to bring in another experienced striker. We have to use Mo’s money wisely. My last post was a warning that we should not squander it on excessively bloated transfer fees for an unproven player at this level. By all means take a punt on a non league player as we did with Mo, but to pay £200k+ is just absurd and I support GJ for not doing so. Fykde did not accept the bid because in their own words it did not meet their valuation - they went public hoping to get an auction going. We clearly wanted the player, but we had an upper limit. There’s the prudence you seem to doubt. “To do neither” is what you regard as the problem, but there will be another target, probably a loan for now, but we clearly have £200k ready for the right player, so something will happen at some stage, either this month or January - and there will be plenty of players not getting games at their clubs looking for an escape. Accrington Stanley on the other hand are to be applauded. The right manager at the right time with the right set of players. Is it sustainable? Who knows? They are favourites for the drop - and don’t forget, we’ve been there before, twice. Rushden & Diamonds showed ambition, and FGR are claiming ambition. Rushden were not sustainable and they went bust. The same could well happen to FGR. If it’s not sustainable it will always fail. Ambition and sustainability have to go hand in hand. Last edited by Lord Elpuz on 10 Aug 2018, 11:53, edited 1 time in total. I am sorry, I was reading too much into the use of 4 question marks. The Club’s balance sheet at the end of the FY will be the public acknowledgement. Yes, GJ & PJ were responsible for bringing Mo Eisa to CTFC. RCS - if that is the strategy then presumably we would be insolvent now without sale of Mo ?! Re sale of Mo - GJ must have known for weeks his son was interested ; that seems very unlikely to have only materialised in 48 hours before the sale. If that is right, he should have done his buying before announcing sale. Club knew Mo was off before likes of Akinde sold. I was talking medium-long term. The Mo money can keep us in the black for 5-10 years if spread out over that period. I think we would be making losses over that period unless being happy to 3rd or 4th bottom every year. The money won't last that long if relegated ; which is why any apparent strategy is fatally flawed. Relegation would be very different financially this time to 2015 ; you cannot keep relying on something like a legacy or a player pulling you out of the mire. You're right, relegation would be very different financially - the parachute payment has gone up almost £1m. To compete we will probably to run a debt each season...the Mo cash could fill a £100k per season deficit for ten years and stop the roof falling in. Regarding crowds, I think it's time to accept that Cheltenham is an odd place mainly full of the stuck up and tightwads who wouldn't dream of throwing their money at football, especially the little club in Whaddon, when they can spend a few hundred quid in The Ivy or The Queens, or would prefer to nip down and watch the rugger at Gloucester/the local club, or see themselves above football and either a) participate in other sports of a "higher class" or b) aren't interested in sport at all. High proportion of people who live in the town are from elsewhere in the U.K. so no affiliation to the local side, and £21 a lot to pay to watch a team you don’t care about. Of my core group of friends from school: two dad’s from Yorkshire, two from London, one from Scotland and one from Northumberland. My mates all support same club as their parents first and foremost and only come to Cheltenham when I drag them along every couple of years. Whereas half my family is proper Cheltenham two generations worked in the recreation centre, a close relative shared a back fence with Parklands, even. So I was taken to the footy as a kid. Which is why I have an ST despite living 275 miles away. But will my mate’s kids grow up supporting Cheltenham? Nope, because only one of my mates lives in Cheltenham. The rest are in London (2), Cambridge (2) and Norwich with partners from elsewhere in U.K. or the world. So they won’t have a reason to support the Robins. A lot of the people with the money or specific jobs to move to Cheltenham have kids who move away for university or work, so there is no building up of a fan base. When I go to the pub with my uncle after a match his drinking pals ask the score, but are more concerned with the results of the team they support from wherever it is they are from and grew up supporting. People who don't go to watch football at Cheltenham Town are either tight or stuck up?? I take it this is a wind up?? People are fully entitled to spend their money how they choose. Perhaps those tight/stuck-up people consider people who watch Cheltenham Town as thickos. Who knows?? What I do know is that there is little incentive to casual supporters when prices are high to watch the last two seasons of rubbish. But don't worry, it's not Gary's fault. No, I didn't say people who don't go to watch Cheltenham Town are either tight or stuck up. I said that a lot of people in Cheltenham are tight and/or stuck up. And I stand by that 100%. I have a dozen or more stories I could tell regarding this but won't due to the fact I can't be bothered and it's not my place to share others peoples lives. "little incentive to casual supporters when prices are high to watch the last two seasons of rubbish" is pretty much what I said, but dressed up differently as to put the blame on the manager and club, when other clubs around the country have similar problems and charge similar amounts but have bigger home attendances. As Lord Elpuz said, crowds hardly even turned up 3 years ago when we ended up walking the Vanarama, with only the FGR and last two games when we won the division and had the trophy presentation getting crowds over 4k, if memory serves. We could be top of this league playing great football in November and we still won't be getting 3500 home fans. This just isn't the Cheltenham I know. I don't know a single person who goes to the The Ivy (where even is that) or the Queens. I could count on one hand the amount of people I know who go to watch rugby regularly. However in contrast I do find most people have a very poor perception of CTFC and instead look down on them and support premiership clubs. What you describe above sounds like less than 5% of the population (and I am being generous) in a local population of around 250,000. One of the [many] problems that CTFC has is the awful media coverage. Chelt echo covers but seemingly negatively [mostly], Glos citizen [? no idea, but suspect little coverage as mainly that silly game with an oval ball - no doubt some-one will enlighten me], my local the Wilts Glos Standard [which is UK's worst 'newspaper'] does not print references to CTFC at all [but gets FGR coverage due to its reporter J Light [a FGR addict!]. The Western Daily press has the odd coverage, but concentrates on the Bristol Clubs, footy and rugby. So if we have a press officer, for want of a better word, go for it! So you don't socialise with that set. Neither do I. But I know of them through work. The Ivy is where the old Lloyds Bank used to be at the top of Montpellier. The rotunda building. I'm sure we've all tried to impress a girl by taking them to the Montpellier Wine Bar and bought couple of drinks for £18 before saying "it's a bit crowded in here - let's move on to somewhere quieter..."
The IVY wouldn’t have opened if no demand. My simple point was that the vast majority of Cheltenham public are not stuck up toffs, it will be a very small percentage who fit that stereotype. Well whatever they are they don’t want to come to CTFC matches. So if you like going to nice restaurants you're a stuck up toff?? I do wonder what world some people on here live in. That's exactly what I was saying. Well done. I believe that you live in the world of taking everything extremely literally. It must be an absolute nightmare for you. A few hundred quid ????? WTF are you ordering ????? The Ivy is no more over priced or not worth the value, than many watering holes in Cheltenham. To try and group people by where they choose to spend their hard earned is way off the mark. Maybe they choose to treat themselves in this way, rather than go on a holiday? Maybe they treat themselves once in a while. Who cares ??? Fact is some people don't like sport, of any kind. Others prefer Rugby. Both my sons were ST holders (OK I paid for them). One now only watches Pro 14 rugby and has zero interest in any football. The other watches both sports and when at home always watches CTFC with me. What do you mean WTF am I ordering? I spend £400 at WR, but I don't so it in one bloody day, do I. Do you take exception with every generalisation and example that is used to make a point that you hear on TV/radio as well, or just this forum?! Allow me to try, and no doubt fail, to explain my point slightly differently; There are people in Cheltenham that think they're above football, especially a club in the 4th division that play in Whaddon. There are people like that in every town/city, I'm sure, but there seem to be a lot more in Cheltenham in my experience, and a lot of them live in a particular affluent suburb. A lot of them are middle aged and older and have no history with football, and they prefer to spend their time doing things that a lot of the country would see as upper middle class or above, such as going to "fancy" restaurants, the many festivals that are put on in town, horse racing (debatable, I know), rugger, etc. Now, I'm not saying there's anything wrong with that, even if I call them stuck-up or toffs. It is indeed their money and they can do what they want with it. This is merely an observation by myself as to why a town with a healthy population has such a low average attendance at their football club. If we turn into Chelsea then I'm sure a lot of them would come along and experience it. Obviously, there are many other reasons why people don't go. I work with a girl who is a Man City fan because her dad is a fan and he took her when she was young. 20 years on and she's still a massive fan, but she's lived in Cheltenham all her life and only went to her first game against FGR last year because she had a free ticket and City weren't playing at the same time. I also used to sit next to a couple of guys at games that would leave a Cheltenham match 10 minutes early on a Saturday if Spurs were the 5:30 kick off on the TV. Whichever way you look at it, there's a general lack of interest in the club until we draw a big team in a cup or are a game or two away from winning a division. I have always said the only way your going to fill our ground with spectators is to hold a show jumping event at the end of the season before the pitch is relayed. Whichever way you look at it, there's a general lack of interest in the club until we draw a big team in a cup or are a game or two away .from winning a division. Hvae only lived in 3 places in my life. The picture you paint seems to apply to all 3 places. Indeed people regularly travelled to England and Scotland to support football teams rather than one a couple of miles up the road. Cheltenham crowd, I don't think has changed much in its makeup since 1983. Still the same (mostly) decent bunch of people there today that there was 30+ years ago. Totally agree that some people (most people), have no interest in football. Some see it as one of the sports they would go and watch and others are exclusively football. However, as you say, premiership or Scottish Premiership teams attract a good % of the last 2 groups. Maybe it is teh facilities and L2 grounds that people consider a negative when thinking about what sport to watch? Maybe, they are like me and prefer to sit with a nice pint when watching a game and chatting with those around, about the game and all matters under the sun? Re: saleable to more of society. That is a pertinent issue. Many in society don’t want to go an watch sport or an event with a bad view, with people using bad language around them or abusing the players and performers, or be at risk of smoke or heat from flares, for example. Yet any measures the Club takes to change this gets criticised by people on here. Many things happen at football games which would be unwelcome in wider society, so it’s no surprise wider society doesn’t want to come to matches. My aforementioned group of friends all went to Cambridge away in the first season back up. Now the football was dire but at least we could have a laugh at the Parslow and Downes comedy act which was comical. However, a group of fans turned vicious in their abuse of the players and really put a dampener on things. Some of my mates vowed never to go again and they haven’t due to the atmosphere amongst fans, when usually they would come along for a laugh and chat with the group. My fear is that if it turns sour at WR, even more fans will be put off and we will end up with 1,000 die hard supporters, 1,000 going to abuse Gary, and the rest of the town thinking the whole thing is pathetic. Whilst I see your general point RCS, we're hardly Millwall or Cardiff. Whilst there may well be some vitriol at times (and I will never condone abuse to players or management). Cheltenham is not a very working class town and, unlike a lot of northern towns where football was ingrained in the community from the late Victorian times and early 1900s, through to the boom days of the post-war period with even clubs like Rochdale averaging around 6,500. Kids were taken to games with their Dads from generation to generation and it's ingrained into their psyche. Cheltenham doesn't have that. My uncle brought me to my first few Cheltenham games, but he also brought a load of my cousins, I'm the only one who still goes. My first Cheltenham game was in 1994 - that season we averaged 1,013, with it massively increased by the game with Gloucester City which had an attendance 2,691. By the end of our first season back in the Conference we were averaging 1,837. The trip to Wembley in 1998 obviously galvanised the town, and success in 98/99 saw the average shoot up to 3,112. As expected, the novelty of the Football League saw attendances increase again (over 4,000 for our first season), and our first season in the 3rd tier of football saw attendances over 4,500 for the first and, so far, only time in our history. The problem is that the novelty has worn off. A lot of people have stuck around after the success of the late 90s/early 00s, and the bit of success in 2006-2008 or so meant that near 4,000 averages were maintained. Since relegation in 2009 though the novelty of 4th tier football has worn off. We have been dire for a lot of the last 10 years, with only 3 relatively successful seasons (1 playoff final, 1 playoff semi and the Conference Championship). Attendances after promotion in 2016 only increased by 300 or so and you could argue that is due to the increase in away fans rather than home fans. When I've spoken to people in the recent past about Cheltenham a lot feign interest and then will say something along the lines of, it's too expensive now, or the I used to go regularly but they're rubbish now. It doesn't matter what the club does now, reducing prices, adding half-time entertainment, etc... it's all about a novelty to entice fans, a big cup game won't necessarily do that (we didn't sell out the home game to Everton), in fact even a single promotion to the 3rd tier might not necessarily do it either. It needs prolonged success, promotion followed by a decent tilt at another promotion rather than promotion followed by a relegation battle. It also needs parents to bring their kids and for the kids to have it take hold of them like it did me. That is much easier said than done though - as I can confirm as I struggle to get my boys into the Robins.